VeryPDF PDF Extract Tool Command Line is a program developed for extracting fonts, images, drawings, text contents, text positions, metadata, document properties, etc. information from PDF files. This is a brief user guide for it. VeryPDF PDF Extract Tool Command Line is a portable application, and it does not need to install. Download the package, unpack it to the disk, open a command prompt window in Windows system, and then you may run it. In the rule, "pdfextract.exe" is the executable file, field of options is for specifying options, "input PDF" indicates an input PDF. The following command line will extract all information from the given PDF file "test.pdf", and show these information to console. pdfforms.fdf: Extracted form fields, this file is contain all form names and form values, the contents are available in UTF-8 format. *.cff;*.ttf;*.afm files: These files are extracted fonts, you can reuse them in MS Word, Photoshop and other drawing editor applications. *.ppm;*.pbm;*.jpg;*.tif;*bmp;*.png files: These files are extracted images. PageContents.xml: This file is contain the drawing information, such as, transformation matrix, fontsize, graphics state, color space, single character position, path, filling, etc. information. Metadata.xml: Extracted metadata XMP file. 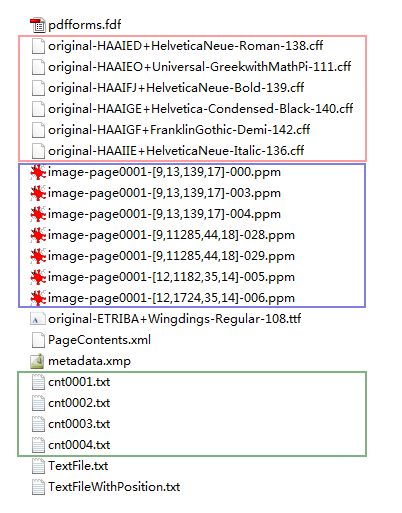 cnt*.txt files: These files are contents of original PDF pages. TextFileWithPosition.txt: Text contents with positions.